We’ve all heard it before. Buying a home is one of the biggest financial transactions most people will ever make in their lives. And selling a property is no easy task either. That’s why it’s so important to have the right team of professionals on your side. Though it is tempting to hire an inexpensive attorney, this may not be the right time to do so. Your attorney should be one of your strongest team players, and if you aren’t careful, you just might get what you pay for. Let’s cut right to the chase. What is hiring an attorney going to cost you? We don’t believe in gimmicks or tricks. And we really dislike hourly billing – and so do our clients. We charge a reasonable and affordable FLAT FEE for our services. The price we quote is the price you pay. Our fees are typically in the range of $1,750 to $2,500, depending on the complexity of your transaction. In some circumstances, we do offer our clients a discount on our fees. We pride ourselves with our passion and experience in the field of real estate. 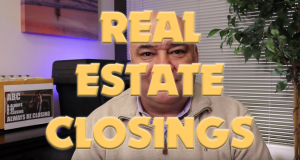 From a young age, Steve has been involved in real estate transactions, from learning the ins and outs of owning real estate, the mortgage and financing side of real estate, and the management of real estate through investment properties. In addition to being a real estate attorney, Steve is a licensed real estate broker, having purchased and sold properties for clients and himself. So when you hire our firm, you are getting a “real estate attorney,” not just someone that says they are a real estate attorney or simply lists real estate on their list of “services” provided. It’s important to have faith and confidence in the abilities of your attorney. Steve not only has the experience to handle just about any issue that may come up along the way, but he’s also an excellent communicator. Clients often comment on how much they appreciate Steve taking the time to explain things, or to be available almost any time of the day or evening, even weekends if necessary.